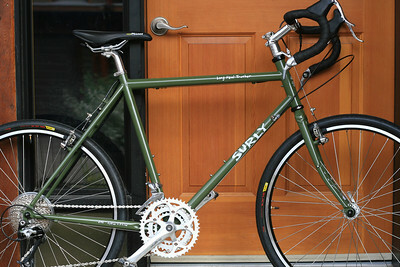 Thanks to the guys at Campione in Calgary, I’m now the happy owner of a very shiny Surly LHT. It went for its first test ride today, and seems to work. And aaahhh, the smooth gear changes of a brand new bike. All stock components on it so far, no upgrades to fancier parts. I’ll probably keep it that way too, until things actually need replacing… except perhaps the saddle. A comfy saddle is always good. Campione is a few blocks from me great store. Next time you are there drop ma line and I’ll zip over on my LHT for an impromptu Trucker Club mtg….hahaha….enjoy the new ride. i love my surly cross check – took it out for the first time in months as i’ve been riding my race bike for the past 7 months (c’dale cadd 9, op2). r is going to build a city bike. exciting! Hey, great looking bike. I just picked up my LHT last week too! 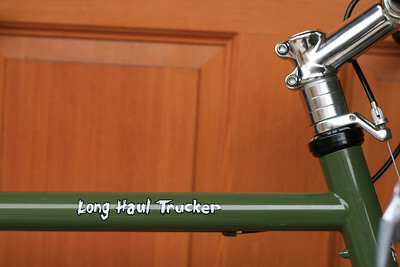 I haven’t long but a few miles, but I’m sure it won’t disapoint for a comfy, long distance cycle. Cheers.